Recent release “The Book of Nations” from Page Publishing author Merit Broal is both captivating and cultural; this work explores the ideas of personal identity, finding one’s self and the diversity of the world. Merit Broal, a poet, professional chauffer in New York City for 30 years, devoted writer and author, has completed his newest work “The Book of Nations”: a passionately crafted work that portrays the beauty of life and self-worth. Published by New York City-based Page Publishing, Merit Broal’s telling compilation of poems will keep the reader intrigued and enlightened. These poems are based on the human spirit. A realization that underneath what is obvious, there is something deeper going on. Something often felt and easily overlooked. The human spirit can be explored and discussed in a general way, but most importantly, it is an aspect of ourselves that should be celebrated in a big way. Despite people’s differences, they know that in spirit, they are all one. And in these poems, all the little things that make people human are applied to countries as well. Each nation, each culture, has something unique to give to the world, and world civilization is the richer for it. "Humanity" should really be defined by the word "celebration." In spirit, differentiation enriches everyone, and offers a greater understanding of what humans are as a species. 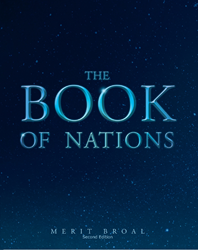 Readers who wish to experience this profound work can purchase “The Book of Nations” at bookstores everywhere, or online at the Apple iTunes store, Amazon, Google Play or Barnes and Noble.